ANIMAL NATION DOESN'T KNOW ANYTHING. : Albums of Influence - Bike For Three's "More Heart Than Brain"
Albums of Influence - Bike For Three's "More Heart Than Brain"
Bike for Three's "More Heart Than Brains"
I've always thought Buck 65 is creative and unique, but I was never really a fan(atic) of his work. I'd heard this song or that song, seen him play live (2nd best hip-hop show I've ever been to, falling right behind Wu-Tang's Raekwon), and had plenty a friend recommend one of his many albums to me, but I'd also always had a hard time getting deep into his work. 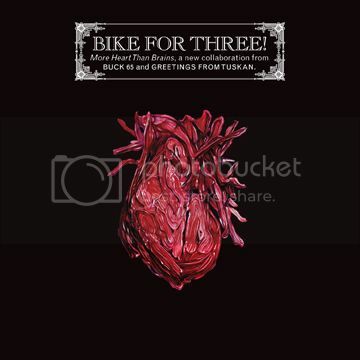 That all changed the moment I heard Bike for Three, a collaborative album between Belgium electro artist "Greetings From Tuskan", and Canada's own hip-hop (?) artist "Buck 65". Buck has never been more emotionally raw, nor has his off-kilter rap style fit any piece of music more perfectly than it does on this electronic, yet fabulously musical, 15 track album. With lines like "The homes we chose vs. the one that we imagined," there's almost more to what Buck isn't saying than what he is, lending your own mind back through a series of unchosen long-ago-possibilities of what could have been. This album is exactly what hip-hop, a genre that's been churning out the same radio-friendly auto-tuned hit for the past 5 years, needs so badly. Bike for Three shows what hip hop could be if producers still cared about the music they were making, if rappers weren't solely driven by their desire for fame and fortune, and if consumers, my self included, dug past hip-hop's bland sludgy exterior that is mainstream rap more often. Here's to hoping that this album gets all sorts of recognition, and wins every hip-hop award available this year, including any of the awards that our cash-in-hand-bribes and dark-alley-car-washings may have got us nominated for ourselves. It's true. This album is amazing. Download it for free here. Then rush out and catch Buck 65 live. If you liked this album, make sure to buy Buck 65's "Situation".